The real heroines in this summer’s movies don’t need a CGI treatment. I’m not sure why Gal Gadot, star of Wonder Woman, reminds me of an asparagus spear. Maybe it’s because she’s such a strikingly vertical figure. Maybe it’s the sleek braid that often tops her stalk, or the air of healthful vigor she exudes, heavily redolent of thiamine and riboflavin. Or maybe I’m associating her too closely with the vegetative state of the movie in which she’s been planted. Yes, the “summer’s most anticipated release” is a slog, a schlep, a bore, a brainless and unstoppable encroachment of kudzu across the world’s screens. Anticipated by whom, by the way? By the people who chose to respond to a Fandango survey, the results of which have been cited by The New York Times with a bland credulity last accorded to polls favoring Hillary Clinton. Is there a connection? Not really—except for a misplaced faith in feminist exceptionalism. Many people, myself included, have deplored the American film industry’s indifference toward stories about female characters of any description, its blindness toward actresses who have passed the age of 40, its malign neglect of women who stand ready to produce or direct films. That said, there is no reason to think that the world, or even the subset of it known as cinema, will improve solely because a comic-book-franchise blockbuster has a woman as its lead and another woman in the director’s chair. Which, I think, is the point. The screenplay for Wonder Woman, written by Allan Heinberg from a yarn he concocted with Zack Snyder and Jason Fuchs, is an origin story about another, even dumber origin story, with a third origin story popped in toward the end. Flashback lurches into tedious flashback, while in the interim, blurs of jerky, chopped-up action and CGI explosions fill the spaces where you might have hoped for credibly choreographed battles. Left unemployed, your mind wanders after this or that odd detail: noting which historically oppressed groups the filmmakers have ticked off their diversity list (hey, a North African and a Native American! ), or puzzling over the film’s curious version of narrative economy, which enables characters to surmount Olympian barriers and span thousands of miles merely by saying they’ve done it. Mostly, though, you watch the protracted, single-entendre flirtation between Diana, daughter of Hippolyta, and a World War I–era Yankee soldier who has somehow barged into her island paradise. Because the soldier is played by Chris Pine, he not only looks great but is also nimble with banter, self-mocking humor, and the flummoxed reaction shot. Perhaps the best that can be said for Wonder Woman is that someone had the wit to cast Pine in the boyfriend role, and that the director, Patty Jenkins, knew how to use him as a foil for Gadot, improving the effect of the dumb-but-smart deadpan she’s learned to perform. I admit she’s a clever enough asparagus to get by with the act. Just don’t expect her to threaten the memory of Carole Lombard. What else has Patty Jenkins brought to the project? A filmmaker who made an impression in 2003 with her very good first feature, Monster, starring an uglied-up Charlize Theron as the accused serial killer Aileen Wuornos, Jenkins certainly knows how to take command of a vehicle. But in the case of Wonder Woman, she seems rather to have been along for the ride. She was plugged in as the second-choice director for a property that was cast before she was hired, written by others to conform to the Warner Bros. franchise scheme, and bossed by a team of 13 producers (11 of whom are men). In that light, it might be more appropriate to say that Wonder Woman teaches disempowerment—the lesson that special-effects blockbusters are now the driverless Ubers of cinema. The algorithm decides all, and the only destination it recognizes is a bank where you don’t have an account. Once upon a time (goes the origin story), when the studio system was not yet defunct, a band of heroes called Auteurists championed those filmmakers who were capable of imposing their personalities on genre stories, affirming the individual in a society of mass production. In 2017, though, trying to detect a personal vision in Wonder Woman is as futile as searching for financial security by jumping into the gig economy, or resisting conformity by rushing to be the next to post on a social-media thread. I’m glad for Jenkins that she got the job. But has this crummy movie struck a blow for women? Tell it to the algorithm. If you’re looking for a heroine with whom you’ll want to spend some time in the movies, let me recommend Shynika Jakes, one of the three principal figures in Andrew Cohn’s documentary Night School. 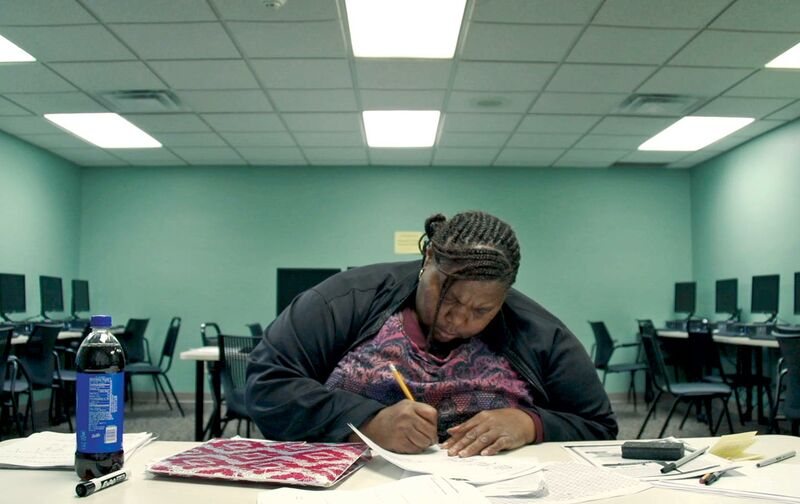 When Cohn began filming in 2014, Jakes was a 26-year-old high-school dropout living in one of Indianapolis’s poorest and most violent neighborhoods—living in her car, since the money she made at Arby’s didn’t stretch far enough to cover a luxury such as rent. Determined to make a better life for herself, maybe as a nurse, Jakes decided she had to get a high-school diploma—not a GED certificate, a diploma—no matter what it took. That’s how Cohn met her. Wanting to show audiences how tough it is for people to climb out of poverty, he embedded himself at a high school in the neighborhood—one that had been established exclusively for adult dropouts—­and met Jakes, who agreed to let him follow her around. If Frederick Wiseman had been the one to go to Indianapolis, he would have used the title Night School literally, planning and editing his production to construct a picture of an institution. Cohn, who adheres more to the character-driven approach that Steve James, Frederick Marx, and Peter Gilbert took in Hoop Dreams, scarcely even identifies the school his subjects attend. (It’s the Excel Center, a charter school started by the Goodwill organization.) Instead, he keeps his focus on three perpetually weary, vulnerable, hard-pressed, and endlessly brave individuals, bringing you close to them through a mutual trust that can’t be faked. You see Henson coping when his brother is shot, when his daughter has to be rushed to the hospital with a seizure, when his bid to have his criminal record expunged leads to his having to report to the county jail—one damned thing after another, and somehow the man keeps showing up in class to solve equations. For her part, Jakes takes the risk of not showing up: Having been drawn into the Fight for $15 organizing campaign­—­tentatively at first, and then more intensively—she eventually takes to the street as a striker, jeopardizing her diploma and her meager wages at Arby’s, but finding a public voice for the first time. Lewis, who might be the most fragile of the three, overcomes her solitude during the film—Cohn’s camera is there when she meets the new love of her life, on the bus—but despite all her hard work, she just can’t do the algebra. When, in her dejection, she comes close to dropping out for the second time, Cohn is there as well; and he’s with her in church when she finds the strength to keep going. It might seem apt to say that the subjects of Night School are indomitable, if you knew only the outcome of their struggles. But if you accept Cohn’s invitation to watch their herculean labors, you understand that Lewis, Henson, Jakes, and millions of others live full-time on the cliff’s edge of defeat, with the circumstances into which they were born conspiring to push them over. Night School is a happy-ending documentary, one that cheers on three people who triumph through individual grit, as Americans are supposed to do—but the film makes it clear that each diploma awarded at their high school ought to come with a medal for exceptional valor. The feature-length documentaries selected for this year’s Human Rights Watch Film Festival, presented June 9–18 in New York by the Film Society of Lincoln Center and IFC Center, pay special attention to three broad topics: the world’s refugee crises, the abuses built into America’s criminal-justice system, and threats to a free press. The opening-night presentation, Zaradasht Ahmed’s Nowhere to Hide, chronicles the effects of endless war on Iraq and a family’s deliberation about whether to flee the country. The closing-night film, Brian Knappenberger’s Nobody Speak: Trials of the Free Press, documents the power of billionaires like Peter Thiel and Sheldon Adelson to control, or simply shut down, publications that displease them. In between, festival audiences can catch selections like Peter Nicks’s The Force, which takes a close-up look at corruption and incompetence in the Oakland Police Department, and Erik Ljung’s The Blood Is at the Doorstep, about the aftermath of the fatal police shooting of Dontre Hamilton in Milwaukee. With so much to feel bad about, maybe you’ll forgive me if I pluck Cristina Herrera Bórquez’s No Dress Code Required from the schedule, since it’s another happy-ending documentary about self-made heroes. Its stars, Fernando and Victor, operate a beauty parlor in Mexicali, where over the years they have glamorized countless brides. In 2013, inspired by the marriage in Mexico City of TV star Felipe Nájera, they decide it’s their turn. Unfortunately, though, the government of the Free and Sovereign State of Baja California proves to be less accommodating than that of the Federal District, as it was then known. No Dress Code Required is the story of Fernando and Victor’s 18-month battle, from June 2013 through January 2015, to get the municipal authorities to perform a function unambiguously mandated by law—a right they claim not so much for themselves (since they can be married in Mexico City at any time) as for everyone in their state. As the loving couple explains to the camera, the government’s callous opposition reawakens in them all their long-buried feelings about being demeaned, bullied, and pushed to the side. But these supposedly negligible hairdressers have resources the government doesn’t anticipate: nerve, flair, friends, excellent lawyers and wardrobe, and a calm eloquence, no doubt previously untapped, that perhaps surprises even them. Unless you’re a religious scold, Fernando and Victor should be irresistible; and so is No Dress Code Required, a film that comes out totally gay in both senses of the term. One more hero, while I’m at it: the grieving, vengeful mother played by Emmanuelle Devos in Frédéric Mermoud’s Moka. Movies about female vigilantes are rare outside the realm of martial-arts epics and the deliriums of Abel Ferrara, which makes this cool, precise psychological thriller all the more notable. Based on a novel by Tatiana de Rosnay, Mermoud’s film follows a woman whose only way to bring herself back to life is to find and confront the hit-and-run driver who killed her teenage son. What will she do when she finally arranges the confrontation? She doesn’t seem to know, which is fitting for a film about crossing borders, whether geographic (between Switzerland and France), sexual (between more than a few of the characters), or legal. The tension builds slowly as Devos identifies her target: a beauty-shop owner in Évian (Nathalie Baye) who seems certain to have been the driver and yet is too brittle under her strained, professional smile for Devos to hate. Moka is a neat package, pleasingly spare in its dialogue, that might have seemed like a minor Hitchcockian exercise if not for Devos. She remains the most dangerous woman in French cinema: someone who projects a sensuousness that is still startling in middle age, with her wide, downturned mouth and insolent eyes, combined with a visible intelligence so smoldering that it could get her charged with arson. I probably don’t need to say it, but American pictures have no equivalent.